. Excellent for a large group of people. The annexe gave privacy without being far away from the family! A car would be definitely needed. Would certainly recommend Finca Tropical. So glad you had an enjoyable and comfortable stay at Finca Tropical with your family. I am glad you enjoyed the garden, views and that the grandchildren enjoyed swimming in the pool. We would be very happy to welcome you back if you are visiting Coin again! Lovely clean, spacious, private, and well equipped villa. We enjoyed a comfortable 10 days stay there. Outside space is perfect, the pool area has the sun all day (although there are always shady spots if required). The kids really enjoyed the swimming pool. The surrounding view is the best we have had for a long time, especially from the upstairs terrace. The last bit of the road, especially the sharp left hairpin bend leading to the villa was a bit of a tricky one. It would have been very interesting if we had met a car coming the opposite way. Steve, the maintenance guy is really friendly and very helpful when required. The villa owner is also really helpful and quick to respond to any messages anytime. So all round, very good villa and lovely area to stay in. Would highly recommend. Wonderful views. Lovely accommodation spacious 6 adults in our party Well equipped balcony views and experience great!Pool every day in spite of weather Kate a brilliant renter. We are so glad that Finca Tropical provided a perfect get away for you and your family. The pool heating was certainly a great help with the cool weather! It is always a pleasure to rent to lovely guests and we hope that you will visit again soon! Only the weather made the stay anything less than perfect. Pool each day, several breakfasts on the patio and on the rainy nights cosey meals indoors. Barbeque brilliant. Views magnificent. Six adults no arguments due to spacious accommodation. Thank you so much for the 5 star review for Finca Tropical. I expect the pool heating came into its own and I am so glad you were able to enjoy the swimming and the lovely views when the sun broke through! I am glad you had such a relaxing holiday, that is what Finca Tropical does best! I hope very much you come back to visit again as you mentioned you would like to! Alquilé esta propiedad en nochevieja de 2009, a amigos y a mí nos gustó tanto que la volvimos ha alquilar en nochevieja de 2010. Esta casa me encanta por que aparte de tener capacidad para muchas personas es muy acogedora y Karen y su marido son muy buenos y agradables con los huespedes siempre atentos de que no falte de nada. La distribución de la casa me gusta y la pequeña habitación fuera de la casa es muy bonita te sientes como en casa aparte la casa tiene juegos y en el porche una canasta lo cual, no da pie a aburrirse. La piscina esperamos probarla este año que ya estamos pensando en alquilarla para verano aunque hay que darse prisa pues esta muy solicitada. Lo pasamos tan bien en nuestra estancia allí que pensamos repetir siempre que podamos. We stayed here for Xmas - to 'get away from it all'. It did the trick perfectly. What was good? The location, the furniture and fittings, the garden, the table tennis table (and I'm sure the pool is super in better weather - we hit a coldish spell for Andalusia), the local 'carers' and the personal contact to the owner. 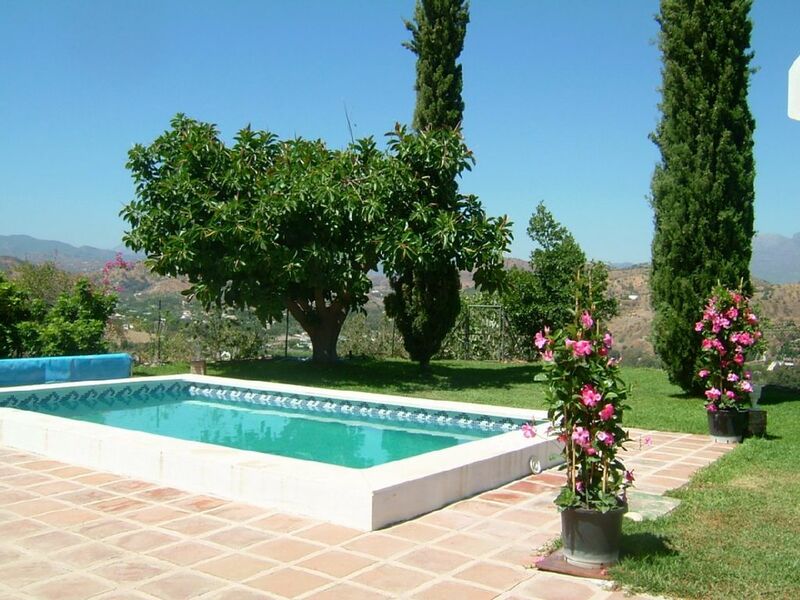 Convenient distance from Malaga Airport, good for other sightseeing, too. W-Lan and British TV! I'm sure it is completely different in the summer, but Andalusia at Xmas is lovely with all the citrus fruits on the trees, and Coin was a riot at New Year's Eve! Less good - the electricity and water supplies. The beds. But all in all, we were very happy with our choice of Finca - despite slightly below-average weather. Many thanks to the owners! All information provided is accurate and correct. We are so glad that clients find this a relaxing holiday even in the winter. The electrics and water issues are being repaired as we write this. You wont believe the views and the quiet! Please note that on changeover days the house will be available from 4pm onwards. Departure by 10am on your departure day. If you require extra linen for a two week stay please let the owner know and there will be a charge of £12 per person. Pool heating is available in late spring and early autumn for £80 per week.